Circuit’s intuitive sequencer meets the Bass Station II’s analogue synth engine. The combination of a solid analogue sound engine, uniquely powerful sequencer and competitive price point make this a must-try synth. Flexible modulation matrix including auxilliary CV out. Deceptively deep sequencer, capable of paraphonic and polyrhythmic sequencing. Most parameters can be automated. Good range of analogue and digital ins and outs. Without a screen, editing can get a touch confusing. Circuit Mono Station is, in loose terms, a hybrid of two of Novation’s best instruments: a combination of the meaty analogue synth engine of the Bass Station II, and Circuit’s excellent sequencer. Housed in a chassis similar to - but slightly taller than - Circuit, Mono Station’s interface is roughly divided in half, with the upper section housing the synth controls and the lower portion controlling the sequencer. The synth itself is like a remixed version of the BS II. At its heart are a pair of digitally controlled analogue oscillators - switchable between sine, triangle, saw and variable-width square waves - accompanied by a sub oscillator, which tracks osc 1’s pitch, and a noise generator. These can all be dialled in via the mixer, which also features a gain control for an external audio input, and a rotary for dialling in ring modulation. Mono Station loses the multiple filter types of the BS II in favour of a single multimode filter, switchable between low-, high- and band-pass, with -12dB and -24dB slopes. There are resonance and cutoff rotaries as well as an overdrive control, allowing the signal to be pushed hard into the filter. A bypass switch allows either, or both, of osillator 2 and the noise oscillator to dodge the filter completely, which is handy for creating percussive sounds. Beyond this is a distortion section, switchable between three modes: one offering the distortion circuit from the Bass Station, one offering a new fuzz circuit, and a third option that blends the two. There’s a decent amount of tonal variation and, coupled with the filter overdrive, it allows for some pleasingly gritty, aggressive sounds. Modulation-wise, Mono Station deviates more dramatically from the BS II. Here, the envelope and LFO count is reduced to one of each, but both feed into a modulation matrix, which also allows velocity and the sequencer to be used as sources. There are seven internal destinations: pitch and pulse width for each oscillator, filter cutoff, amp and distortion level - plus a CV output. The other major difference from the Bass Station II is that Mono Station - despite its name - operates in a paraphonic manner, meaning its two oscillators can play two distinct notes, albeit fed through the same signal path. This is controlled using the sequencer. As with the original Circuit, the sequencer and playing interface is laid out across 32 backlit pads, with multiple channels selected via a row of buttons above. Where Circuit’s sequencer channels controlled separate synths and sample tracks, here the first two sequencer sections control the individual oscillators with a third channel for modulation. In practice, if a note sequence is only played or inputted via oscillator 1’s sequencer, both oscillators will follow that pitch, but as soon as a note is triggered from oscillator 2’s sequencer, that oscillator will switch to following this second pitch. Presssing Shift can toggle between two different paraphonic modes, dictating whether or not oscillator 2’s sequencer also triggers the amp section. A ‘dual’ sequencer window lets users play both oscillators simultaneously, with osc 1 controlled via the upper half of the sequencer grid and 2 controlled by the lower, allowing two-note chords. As with the original Circuit, the sequencer itself is a highlight here, offering a depth and flexibility that belies its simple appearance. Much of Circuit’s functionality is carried across wholesale, such as the individual tabs for per-step gate length and velocity control, preset scales, the ability to chain multiple patterns into lengthier sequences - up to 16 for osc 1, eight each for osc 2 and the mod sequencer - and the option to vary the lengths of individual patterns, allowing for creative polyrhythmic sequencing. A new Pattern Settings tab adds yet more functionality too, letting users change the note division for each 16-step pattern as well as direction - switchable between forward, backward, ping-pong and randomise. The new modulation sequencer functions in a similar - although simplified - manner to the melodic ones. Rather than offering individual note and velocity tabs, here each step is simply assigned a ‘level’, which is sent into the mod matrix. Mono Station is equipped with a decent array of ins and outs. On the audio front, there’s a main 1/4-inch jack out along with a mini-jack headphone out along the front edge. There’s a 1/4-inch jack audio in too, allowing an external signal to be fed through the filter, amp and distortion circuits. Feeding the headphone out into the audio in can create a nicely gritty feedback loop. There’s a selection of analogue control outs too - offering CV and gate, along with an auxilliary CV out fed by the mod matrix. There’s also pulse clock in and out, along with MIDI in, out and thru, and MIDI USB for DAW sync. There’s a ‘smooth’ function available too, for rounding off the edges of these stepped sequences. This flexible modulation system already makes the Mono Station a powerful sound-shaper, but it’s worth noting that almost every front panel control can record automation too. It all adds up to a hugely powerful way to interact with the synth engine. The flipside to this is that it can be easy to get lost when designing patches. While colour-coded LEDs indicate parameter states under each control, with no screen it can sometimes be tough to keep track of modulation routings. 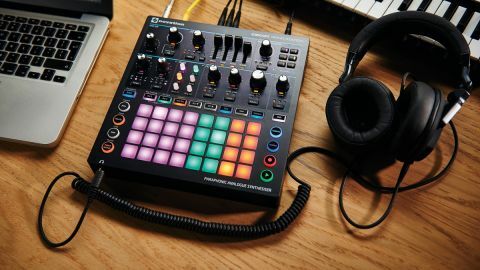 Novation is planning on adding a quick way to clear both mod routings and synth settings in an upcoming firmware update, which may well be out by the time you read this. But the deep, multi-channel sequencer, flexible mod matrix and automation all add up to a workflow and creative experience unlike anything else on the market, combining the best of digital flexibility with a classic analogue synth design. This might look like a hybrid of two existing instruments, but the result is much more than the sum of those parts.